The Hiphopopotamus and Rhymenoceros have dusted off their acoustics and travelled to London, scoffing every complimentary muffin they find. Since their hit HBO TV series (2007- 09), Wellingtonians Bret McKenzie and Jemaine Clement have soared to new heights in their professional disciplines. Bret won an Oscar for his work on The Muppets, while Jemaine has starred in feature films, including Moana and Men in Black III. The most beautiful band in the room tore through a set full of rock’n’roll anecdotes, fine tuned classics and freaky fresh numbers. With their cult status, the Conchords could’ve cranked out every tune from their TV show, forgotten lyrics, sprinkled some of their patented awkward Kiwi comedy on top and grabbed the cash. However, it is refreshing to see the two still refining older songs and creating new pieces with new additional support. That’s right. The 4th most popular folk duo has expanded, performing live with the “New Zealand Symphony Orchestra”. Turns out it’s just a cellist called Nigel. 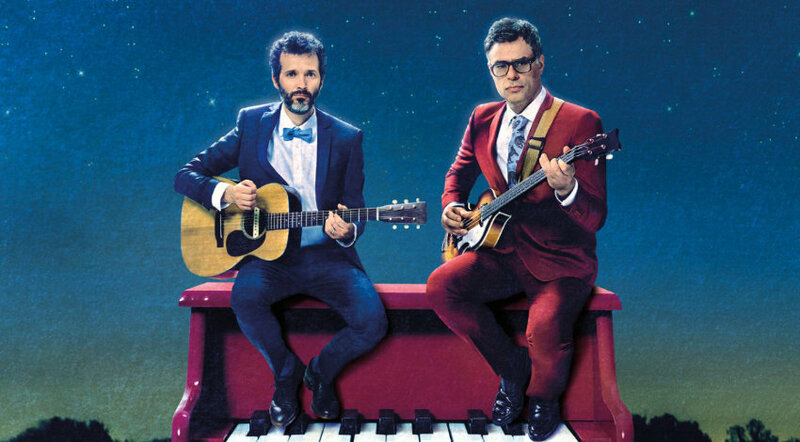 Bret and Jemaine have always written bizarre songs within a range of genres. They’ve expanded this range even further with a whimsical cowboy tale, a jazzy crime, a poetic narrative of a seagull and a heartfelt duet of a hopeless father and son. It’s clear that these old dogs still love what they do and with a rumoured movie on the cards,it looks like the Conchords will still be flying for quite some time.